The Relaxzen 60-425111 is one of our favorite picks for best massage chairs under 500. Find out its strengths and weaknesses in our full review below. The Relaxzen 60-425111 is one of the best budget massage chairs on the market. You don’t get premium features but you do get a very comfortable recliner that gives a relaxing vibrating massage with both preset and custom massage programs. Relaxzen was first launched in 2002 as part of the Comforts Products family of affordable brands. Relaxzen has always been about affordability. If you’re not familiar with the brand, you’ll be surprised to know that Relaxzen is considered an early innovator. They first started out with affordable massage chairs. Later, they branched out to other therapeutic, orthopedic, massage, and wellness products. They’ve also increased their reach from office appliances to those for the car and home. Apart from massage chairs, you can also purchase support massage cushions or lumbar cushions with heat — all exciting products if you’re looking to kit out your home spa. The manufacturers warrant this product to be free from defects in material and workmanship for 1 year. The warranty doesn’t cover costs of transportation and labor and all warranties are limited to the original purchasers. Right off the bat, the first thing good thing to mention about the Relaxzen 60-425111 is its low price point. Of course we love the top-of-the-line Inadas and Luracos, but, let’s face it, you need a lot of disposable income for those. Thankfully there are solid options for prospective buyers out there with a tight budget — specifically a budget under $500. And one of these options is the Relaxzen 60-425111. The funny thing about large premium chairs is that a lot of them aren’t comfortable for just SITTING. They’re a piece of heaven once they get going but just for sitting and chillin’? They’re not always as comfy as you’d expect. The Relaxzen 60-425111, on the other hand, is a really comfortable chair for sitting, not just for getting a massage. This is because of its compact yet comfortable design. You can recline yourself to various positions, swivel around (useful for when reaching for that popcorn and beer), and change the chair height. We love how it’s not overstuffed unlike some bad recliner chairs. It’s really just right, and the material is soft and durable too. Even at this low price point, it’s got lumbar heating! It’s great for winter and warms up those cold, achy bones when you’re feeling chilled or cold. The massagers in the chair are great! The 60-425111 has a remote control that even old fogeys like me can understand. The remote lets you choose which part of your body to target: the upper back, lower back, calves or thighs. You can just choose one or you can choose them all. There are also pre-programmed massage modes, of course, but one notable thing about them is that you can adjust the duration of your massage. You can’t do that for some rival massage chairs and the workaround for those is to repeat a massage session (which becomes a bit of a hassle when your chair goes to an upright position immediately). “Am I going to fit in this chair?” is a common question asked when shopping around for a massage chair. It’s an important consideration too especially if you’re shopping online. You want to make sure that after payment and assembly, you can actually fit on the darn thing. Well, no worries. 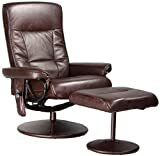 Because of its design and height adjustment, you can sit comfortably on the Relaxzen 60-425111. You can be 270, or even 300 lbs, and still this chair will be able to accommodate you. And now finally the downsides. Okay, so for the couple of hundred dollars you’ll shell out for this chair, it’s obvious that it won’t be top of the line so let’s just get the following out of the way. It’s not real leather, it’s fake leather. It’s also not the fancy shiatsu or air cells massage. It’s vibration massage. Volume is subjective but we can definitely say that the Relaxzen 60-425111 isn’t quiet when it’s massaging (or vibrating). Have you ever had an experience of sitting on a chair and then reaching out for something a bit out of reach AND THEN almost falling over? That’s exactly the kind of thing that can happen to you on the Relaxzen 60-425111. The chair is light and the base is light. If you reach out too far, you can tip over. It’s downright impossible to fall off the regular giant massage chairs since they’re so solid and heavy but you have to be sensible on this model. We also don’t recommend it for elderly folks who have trouble getting out of chairs. Again, you might fall and cause an accident. Used as intended though, it’s very stable. You can’t just have the heat on for a warm and cosy sit-down. To get it to heat up, you have to have the massage going too. It would’ve been a nice plus if you can just sit with the heat on and maybe add more heat in different places apart from the lower back. The Relaxzen 60-425111 is a budget chair. For just a couple of hundred bucks, you can get great vibration massages, lumbar heat, and a really comfortable recliner chair to boot. It’s an awesome deal for what you’ll pay. It looks great, it feels great, and almost everyone reading this could afford to order one right now as a relaxing addition for their home.